When I was younger, I viewed life as linear function. Sort of like the board game, Life. Move down the path, forward only. Get a job, get married, buy a house, have kids, and then make your pink, globe-shaped head, uber-thin wife sit in the back row of the sleek, blue roadster as the fam cruises the plastic landscape. Linear. Set a goal and go do it. Simple. With age and experience I have come to find that life is not really like the game of Life at all, it is more like the Plinko game from The Price Is Right. You know the game. The contestant climb the stairs to the top of the vertical Plinko board and drop big round plastic chips down slots. The board has bumper pins spread over the surface to block the straight path to the targeted money slot at the bottom. Gravity pulls the chip down into collisions with the pins and it moves randomly down the course. Sometimes it glances off a pin and only slightly knocked off course. Other times the chip has a full force, head-on collision with the pin and gets knocked straight backward until gravity wins out again to start down another path. Plinko. Doesn’t that sound more like real life? Hey, I’m not complaining one bit. 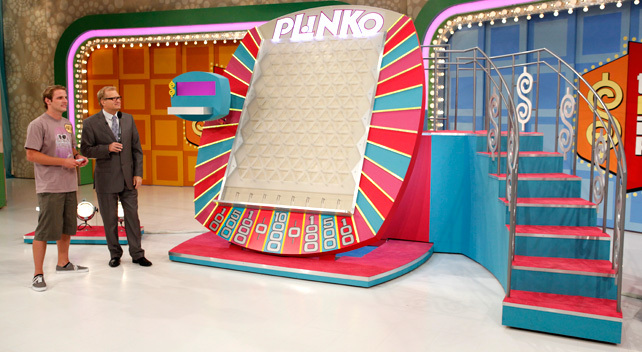 At age 48, with my wife, my three kids, two dogs, maybe two cats, great friends, a house in a cool small town, job(s) and never ending chaos, I welcome the Plinko-life. It is a grand adventure climbing up to the platform above the Hays family Plinko board, aiming our chips at the intended goals at the bottom of the course, and then letting go. Yeah, we fret when the chips glance off pins and veer away from their intended course. We feel the pain when a chip hits a pin head-on and gets knocked backward. Sure, it hurts and is a bit disheartening to see the chip plink further and further from the big prize. That’s where the fun begins. We laugh as the chips dances down the board. We learn to enjoy the journey and try to get the most out of the new directions. These surprise changes of direction become moments of great joy, truer and more real than any plastic scenery can match. Sure, I’ll miss my cool, blue roadster, but I kind of like my chances getting knocked around on the Plinko board.